Money is the issue that kicks off Giuseppe Verdi’s last opera Falstaff—the anti-hero Falstaff has emptied his coffers and has targeted two wealthy women with whom he hopes to garner favor. Washington National Opera, an arts organization like many other American opera companies feeling the pinch of the current day financial situation, chose this comic opera by a popular classic opera composer—Verdi, Puccini, and Mozart operas are fare the regular operagoer prefer—to woo opera fans to open their purses and buy tickets. However, one should not overlook Falstaff’s Shakespearian gravitas as well as topic relevancy—financial misfortune and greed. Director Christian Räth has interpreted the story of Sir John Falstaff, which incorporates elements of William Shakespeare’s plays The Merry Wives of Windsor and Henry IV, as a play within a play. To complicate this approach further, Räth begins the play in contemporary time such that before the audience seating is completed, British baritone Alan Opie, a renown Verdi specialist, sits in the role of Falstaff on stage at his desk writing and tossing away rejected pages. The audience soon learns, Falstaff is writing identical letters to Mrs. Meg Page (mezzo-soprano Elizabeth Bishop) and Mrs. Alice Ford (soprano Tamara Wilson). It is obvious this is contemporary time because the light above Falstaff’s head is a halogen lamp and not candelabra. The audience also learns something unusual is going on with the timeframe when contemporarily dressed men in black come out with push-brooms to clean up Falstaff’s litter of paper. In theory, this reviewer finds updated interpretations of old repertory operas more exciting than straightforward productions. However, except for the director’s notes found in the Playbill, how could anyone understand what the stagehands meant to this story set in Renaissance times? For this production seen October 12, 2009, the three-act opera running two hours and forty minutes with one intermission reveals a man who slowly realizes he has aged and not gracefully. Everyone, including the husband of Mrs. Ford, knows about Falstaff’s deceitful intentions and they each devise ways of punishing him. By Act III, Falstaff has been thrown out of Mrs. Ford’s apartment window in a hamper of dirty laundry, which lands in the river below her building. A side story concerns the Ford’s daughter Nanetta (soprano JiYoung Lee) and her amorous interactions with Ford’s employee Fenton (Chinese tenor Yingxi Zhang). 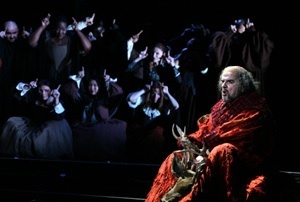 Mr. Ford (baritone Timothy Mix) decrees that Nanetta must marry the old Dr. Caius (tenor Robin Leggate), a character introduced to the audience first in Falstaff’s study where the old doctor had come to complain that Falstaff’s men Bardolfo (David Cangelosi) and Pistola (Russian tenor Grigory Soloviov) had robbed him. While Verdi’s music for Falstaff is lyrical, it is also difficult and the first two acts have a considerable amount of recitative. Without a prelude, the audience is not allowed to tune its collective ears to the innovative music that makes up Verdi’s masterpiece. One problem with Räth’s production is that the stage initially is rather bare and the sound from the singers lost its warmth without set walls to bounce against. Certainly conductor Sebastian Lang-Lessing did not allow the orchestra to overpower the voices on stage. However, spark from the singers did not catch fire until the last act. What made this production come alive was the fanciful rendering of the fantasia that is Act III. Here the merry wives of Windsor—Meg Page and Alice Ford—along with aide de camp Mistress Quickly (mezzo-soprano Nancy Maultsby) tell the river doused fat-bellied man to meet them at the larger-than-life Herne’s Oak for a midnight rendezvous. The women have elaborate plans involving fairies and frightening creatures of the woods. Mr. Ford also plans to use this occasion to marry off his daughter to Dr. Caius. However, intrigue and mistaken identities reign as Mistress Quickly redirects the players. JiYoung Lee, dressed as the Queen of the Fairies, gives an impressive performance. Adding to the merriment of the scene is a supple ballet of the fairies who are men dressed in white tutus and veils. Has choreographer Beth Krynicki created her own Ballet Trockadero? Also notable is Hayden Griffin’s set that brings on stage a huge oak tree that blooms and then afterwards opens out and becomes buildings. So while Falstaff doesn’t get his money, he does learn a few lessons about himself and humankind, which boils down to “he who laughs last, laughs best.” Washington National Opera hopes the goodwill created by the last scene Falstaff will bring audience back for the next WNO offering, Richard Strauss’ Ariadne auf Naxos, another comedy with serious shading.